/proc/meminfo – This file holds information about memory usage on the system. Aside from being used by vmstat, meminfo is also used by the free program. For a complete listing of what each line in this file mean see man 5 proc. 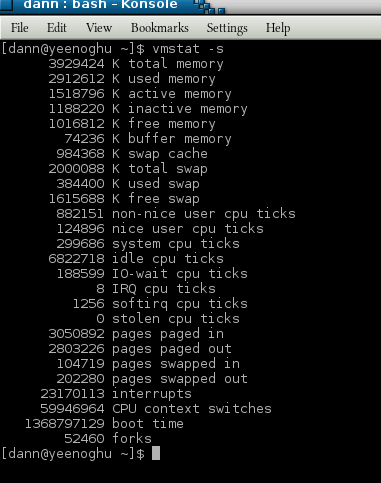 /proc/stat – This file list kernel and system statistics. The contents of this file depend upon what version of kernel you are using. For a listing of what entries may be in here and what they indicate see man 5 proc. /proc/*/stat – /proc/[pid]/stat shows status information about the specified running process. See man 5 proc for a list of what may be in this file. /proc/slabinfo – This file contains information about kernel caches. This file is only readable by the root user and while you can view the information in vmstat, you must run vmstat with elevated priviliges should you elect to report the slab information. See man 5 slabinfo for more information. Virtual memory is a memory management technique that, to the system, provides more memory than is actually available. Instead of a one-to-one addressing of processes to physical memory, the Operating System maintains a virtual table space where “pages” of virtual memory are allocated to processes. These pages are mapped to a physical memory via a page table. This physical memory can be RAM or more slower allocated disk storage like a swap partition or swap file. To best maximize system memory, the Kernel attempts to allocate physical RAM to active processes while moving inactive process to virtual memory. That is, an inactive program may have its page moved to the swap partition. Moving data from RAM to virtual memory can be done by either paging or swapping. Swapping is when an entire process is transferred from physical memory to virtual memory. Paging is when portions of a process are written to virtual memory. A page-out is the writing of the “page” to virtual memory and a page-in is reading the “page” from virtual memory. Paging is normal behavior for a system, but excessive paging can cause problems, especially excessive page-outs. If the tasks assigned to your system exhaust the physical RAM for all active processes, the Kernel may need to push some active process pages out to virtual memory slowing the performance of the system significantly. Using a tool like vmstat can provide valuable insights into the health of your system and help ferret out performance problems. r = The number of runnable process that are running or waiting for run time. A “runnable” process is a process that is waiting for the CPU to run. The schedule determines what runnable process to send to the CPU. b = The number or processes in uninterruptable sleep. A process that is in uninterruptable sleep is waiting on hardware conditions to be able to complete. While in this state they cannot be interrupted. free = This is the amount of idle memory in the system. Idle memory is memory that is no longer used by a process by still has information in it. Idle memory has not yet been reclaimed. buff = The amount of memory being used as buffers. Buffers are raw disk blocks that store information from a process not related to file data. Information like permissions, file location, etc. are stored here. cache = The amount of memory being used for cache. Cache stores file data information for a process. si = The amount of memory (pages) swapped in from disk. in = Number of interrupts per second, including the clock interrupt. An interrupt is a signal by a hardware device or process that demands the CPU stop whatever it is currently processing and switch attention to the device or process raising the interrupt. cs = Number of context switches per second. A context switch when the CPU stops and stores the state of a process to be restored at a later time or when a stored process is returned to active state to continue executing the process. us = This represents time spent running non-kernel code. This is the time the CPU spends running applications started by a user or called by an application started by a user. This is non-system call related processing. sy = This represents system time. System time is time the CPU spends running system calls, calls related to the time the kernel is utilizing the CPU. id = This represents idle time. Idle time is time the CPU is not currently processing a request. This does not mean there are no processes running, just that no process is requiring the CPU. This counter does not include i/o wait. wa = This represents CPU Wait time where the CPU is waiting for I/O to complete. This is the default reporting for vmstat. What gets reported and how can be altered with switches, which will be covered shortly. As stated calling vmstat by itself prints out a summary of system information from the last reboot. Two values can be passed to vmstat. The first it a delay in seconds and the second is a count, the number of cycles vmstat will run for. If you only specify the delay value vmstat, that is no count, vmstat will continue to report indefinetly. Specifying delay and/or cycles changes the reporting values from the last reboot to report the values reflecting the time between the last cycle. The value for delay and cycle must be a postive integer. This will cause vmstat to report statistics every 2 seconds for 5 intervals. The first report will reflect statistics from the last reboot. Each subsequent report will contain the statitics on the previous 2 seconds, the duration between cycles. Changing the unit will not effect the output of si, so, bi, and bo. While vmstat is running it is smart enough to re-print the header if the values increment enough to cause the header to scroll off the screen. This behavior can be suppressed with the -n, –one-header, switch. Dirty – This is a page that is no longer in use but has data that has been changed and needs to be written to disk. Laundered – This is an interim state for a dirty page where it is having the contents moved from memory on to disk. Clean – This is a state where either an inactive page does not have changed data or a dirty page has completed the laundered phase. Clean inactive pages can be deallocated. active = The amount of pages in memory that are currently in use. This display cannot repeat so neither a delay or cycle value will be accepted. The information reported is essentially the same information gathered from the default output just in a more user readable format. Note that some of the statistics are broken out in more detail in this format whereas they are added together in the default reporting. For instance, the default output combines both nice and non-nice user cpu time into just user time whereas the –stat view breaks these values out. 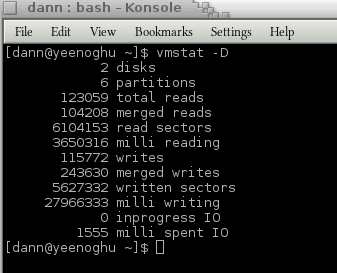 total = This is the total number of successful reads completed from the disk. merged = This is the total number of grouped reads that resulted in one coplete I/O. sectors = Sectors is the total number of sectors that were read successfully. ms = The total number of milliseconds spent reading. total = Total number of writes completed successfully. merged = Total number of grouped writes completed successfully resulting in one I/O. sectors = Total number of sectors written successfully. ms = Total number of milliseconds spent writing to the disk. cur = Reports any I/O currently in progress. s = Reports any seconds spent for I/O. reads = Total number of reads completed successfully from this partition. read sectors = Total number of sectors successfully read from this partition. writes = Total number of successful writes to this partition. requested writes = Total number of write requests made to this partition. The report is a summary of the information for all disks connected to the system. Like the –stat view, the –disk-sum report will not accept the delay and/or cycle value. Forks = A fork call that duplicates a current process. This child process gets a new PID and has the it’s parent PID set to the PID of the process it forked from. Vfork = Similar to a fork, when a process creates a Vfork, the process the Vfork was created from is temporarily suspended until the child process exits. Clone = A clone is similar to a fork but a clone allos the new process to share part of the execution context with the calling process. The –forks switch does not accept delay or cycle values. Cache = Name of cache being reported. num = The number of currently active objects in this cache. total = The total number of available objects in this cache. size = The size of each object in the cache. pages = The total number of pages with at least one active object associated with this cache. The –slabs switch does not accept delay or cycle values. The vmstat tool is a handy utility for reporting on your systems virtual memory use and will give you some statistics on disk storage. This is a handy tool for helping uncover performance issues on a Linux system. The Apache BenchMark tool is a handy application to have in your toolbox that can perform a number of helpful tasks. First, the primary use for the tool is to simulate how your server may react under maximum load. Because of this, if you are experiencing intermittent issues with your HTTP server you may be able to force failures or errors by increasing the load against your server using Apache Bench Marking tool. Be aware, though, that this tool primarily reports requests per second of a single page and is not necessarily indicative of how a typical user may interact with your site. The Apache BenchMark tool is included with the Apache software but may be available in your distrobution under the Apache-Utils package. You do not need to have the Apache Web Server running on the machine you want to run AB against and you can run it against any HTTP server, not just Apache. Only run this tool against a web server that you have permission to test. Running this tool against any website you desire can get you into trouble. Finally, you should not run AB on the same system that you are load testing against. Server Software – The name or the webserver software and the version if reported. Server Hostname – The hostname or domain name of the server benchmarking. Document Path – The path to the document you are connecting to. Concurrency Level – The number of concurrent requests made at one time. Time Take for Tests – The overall time it took for the whole benchmark to complete. Complete requests – Total number of successful responses to the requests. Failed requests – Total number of unsuccessful responses to the requests. If this number is greater than zero further information will be presented showing the number of requests that failed due to connecting, reading, incorrect content length, or exceptions. Write errors – This shows the number of errors that were made during the write process. Total transferred – The number of bytes received from the server. HTML transferred – The number of bytes received from the server that were from the document. Request per second – The mean number of requests the server processed per second. The value is determined by the total number of requests divided by the number of seconds it took to complete the requests. Time per request – The mean across all concurrent requests on how long it took per request. Transfer rate – This is the rate of transfer in kilobytes recived from the server per second. Connect – The amount of time it took to connect to the web server and return the first bits of a response. Processing – The amount of time it took the server to process a request. Waiting – How long it took for the first byte of data to be returned from a request. Total Time – How long it took to complete a request. Minimum – The shortest amount of time taken. Mean – The average number of seconds per request. +/- sd – The standard deviation in milliseconds for the mean. Median – Median is the middle value of all requests. To get this value you would have to list all the result value in numerical order and find the middle number. Max – The maximum number of milliseconds a request took. The final bits of data report the “Percentage of requests served within a certain time.” These values are in milliseconds. In this example 50% of the requests completed in at the most 990 milliseconds. 90% of the requests completed in at the most 2320 milliseconds (about 2.3 seconds). All requests completed within 2654 milliseconds (2.6 seconds) which was the longest request time noted by the test. Now that you have a basic understanding of how to interpret the results of the ab tool, let us return to covering some more of the switches. The -k switch will turn on the KeepAlive feature. KeepAlive will keep the connection open between the webserver and the client to perform multiple requests within the same http session. The default for ab is to have this feature off and require a new connection for each request in the same session from the same client. The credentials are sent in base64 encoding. So be careful if you are not connecting to an secured channel. By default ab uses a GET request which returns the body of the document requested. You can switch to a HEAD request with the -i switch. A HEAD request will not return the body of the message, only the document headers, the meta-information. This will run the benchmark for 10 seconds with the default concurrency of 1 request. -d : Suppresses the percentage served information, the last block of data on the output. -q : Suppresses the progress output while ab is running. -S : Suppresses the median and standard deviation columns in the connection time results. This will also suppress the warning/error messages when teh average and median are more than one or two times the standard deviation apart. This will still display the progress on standard out. The resulting CSV file contains two values: A percentage from 0 to 99 and the time it took to serve that percentage or requests in milliseconds. Primes does not have any options to pass other than the start and stop values. You must provide a start value of 0 or a positive integer. The stop value is optional but if used must be greater than the start value. Chances are the primes command is not installed on your system by default. Primes is part of the BSD games package and should be an easy install via your package manager. Produces a count down from 10 to 1 in 1 step decrements. For more information about the output formats for seq consult the info page. Before closing this episode there is one more BSD Games program to cover: arithmetic. The arithmetic program is a mathematics quiz that will ask you a series of math problems. To proceeded to the next problem you have to answer the current problem correctly. The game will continue indefinitely printing your score after every 20 questions. The default operation of arithmetic will use the number 0 through 10 and only addition and subtraction. There are switches to change this. The default range is 10 and this can be changed with the -r switch. Note that for addition and multiplication the range applies to the addends, terms or factors. For subtraction and division the range applies to divisor and quotient or the subtrahend and the difference. This sets the the terms range from 0 to 1000 for addition and the sutrahend and difference range from 0 to 1000 for subtraction. The first line, real, is how much real time or “wall-clock” time the process took to execute. In this case, 0.007 seconds or micro-seconds. The second line, user, is how much user time the CPU used. User time is amount of time the CPU spends performing an action for a program that is not a system call. The third value, “sys” referred to as system CPU time, is the amount of time the CPU spends peforming system calls on behalf of the program. A system call is a request made to the Kernel by the program. Therefore, CPU time is the total of user time plus system time. CPU time will not necessarily equal real (wall-clock) time, and if it does not total CPU time would be less than wall-clock time. There can be many reasons for the discrepancy between wall-clock and CPU time including the process waiting for another process to complete. In the example above total CPU time is 0.003 seconds where as wall-clock time is 0.007s. Most Linux distributions default to using the Bash shell. Bash has a built in time function that operates as listed above and is quite different than the actual time command. The functionality of the bash time command is very limited to the actual time command. The remainder of this article will focus on the actual time command as opposed to the built in bash time command. If no value is returned chances are you do not have the time command installed (I had this issue on Arch and had to install the time command by sudo pacman -S time, on Slackware it was already installed). There is a lot more information provided compared to the builtin Bash time command. %e = Elapsed wall-clock time in seconds only (this option is not available in tcsh). %M = Maximum resident set size of the process during its lifetime in KB. This value is the maximum amount of physical memory (RAM) this process utilized during the life of the process. %t = Average resident size of the process in Kilo Bytes. This is the average amount of physical RAM the process utilized over its lifetime (not available in tcsh). data = Global data, variables, etc. %D = Average size of the processes unshared data area in Kilo Bytes – This is where data for the process is stored. %F = Number of major page faults that occurred while the process was running. A major page fault is when the process attempts to access a page that is mapped in the virtual address space but is not available in physical memory, it needs to find a space in physical memory to map the page. %R = Number of minor page faults that occurred while the process was running – Similar to a major fault, a minor page fault is when the page is actually loaded in memory at the time but is not marked in the memory management unit as being loaded in memory. The operating system needs to mark the page as loaded in the memory management unit before it can be loaded. %c = The number of times the process was context-switched involuntarily. In a multi-processing environment a process may need to be switched out for another process that needs the CPU. The CPU state is saved so the process can be resumed. Involuntary swapping can be caused by the application being forced to swap out because it’s time slice (a lotted time to execute) was exceeded. %w = The number of waits that the program was context-switched voluntariliy. A volunary swap may be because the process was waiting for another process or I/O action to complete before it could continue. %C = Name and command-line arguements of the command being timed (not in tcsh). 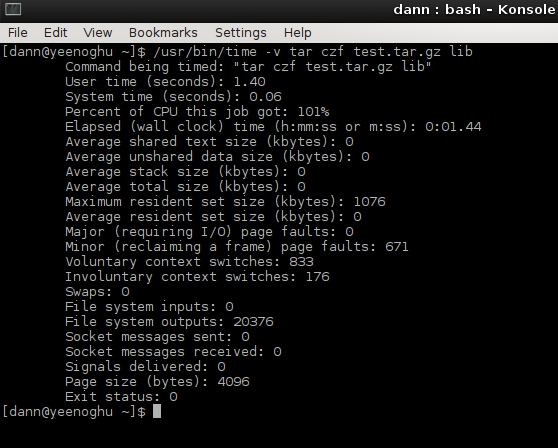 %x = Exit status of the command (not in tcsh). The final switch to discuss is the -v, or –verbose, switch which will output all the values possible that /usr/bin/time can report regarding a process. That is the time and /usr/bin/time commands in a nutshell. Remember, if you want the full feature set of the time command you must provide the full path to the time command. Otherwise you will more than likely use the built in time command of the shell you are running. Video failed youtube processing, will be up shortly, use archive.org link below. This will list the available locales configured for your system. Configuring of the locale values is dependent upon the distribution of Linux you are running. For instance, in Arch Linux you can set the locale by editing the /etc/locale.conf file. On a RedHat based system this value is store in /etc/sysconfig/i18n. On a Debian based system the default locale is stored in /etc/default/locale. Managing locale information is beyond the scope of this article so consult your distrobution’s documentation should you need to change your locale values or set a new default. For the purpose of this article examples will be shown from the LC_TIME=en_US.UTF-8 value. The last row is the relates the format controls to date corresponding to the equivalent values displayed on the second line. These will be covered shortly. Now realize that the actual time would be the time from 2 days prior or 2 days hence from when the date command was run and would not output the exact time string as the first entry. The example was given just an example based off the first date above. Note that the second entry date +%2Y did not truncate the date to two characters. Field width will not limit the output but will pad the output. E – applied to %c, %C, %x, %X, %y, and %Y – %EY – this will use the locales alternate representation of the value. 0 – can only be applied to numeric conversions and will use the locale’s alernate numeric system. The date command is a powerful tool to have at your disposal. Check out the man or info pages for the full list of formatting variables. Notice the output starts with symbols, then numbers, and finally moves to the alphabet ranking upper case letters first. There are a number of options to control how sort behaves. The -d or –dictionary-order option sorts the output considering only blank spaces and alphanumeric characters. It ignores symbols. The entry “bannana” occurs after “Apple” as the case of the items is ignored. Even though the value of 1042M would be greater than 1G. General number sort, -g or –general-number-sort, follows a different rule set from standard numeric sort. It converts each line to a long double-precision floating point number and treats lines that do not start with numbers as equal.. This does exactly what you think, randomizes the output. There is one more basic option to sort and that is to do a reverse sort with the -r, or –reverse. This option can be combined with any of the other options listed above to augment the sort to be reversed. Sort is a handy utility for managing lists. Combined with other commands like uniq, cut, and grep one can produce an output of pertinent data in format that can be utilized to process data quickly. This output can be suppressed using the -q, or –quiet, switch. It should be noted that as the root user the killall command can be very powerful and terminate the processes of multiple users. The killall command will send a signal to all instances of the identified process regardless the user running them. As a normal user with non-elevated privileges the signal would be prevented from being sent to command that user does not have control. But run with elevated or root privileges killall will send the signal to all processes identified for all users running that process on the system. Be very careful with this level of power. The -l works similar to kill -l but it only provides the main signal name sans the prefix: “SIG” and the signal number. Again, like kill and pkill the -s, or –signal, allows you to specify a signal other than SIGTERM to be sent to the process(es). This example would send the SIGTERM signal to any processes run by the command xterm, aterm or gvim. Would only kill aterm and xterm and would ignore Eterm and gnome-terminal. This would send the SIGTERM signal to all the Eterm processes running. The killall command has a 15 character command limitation that can produce unintended results. If the process you want to kill has a command that is greater than 15 characters, killall only matches on the first 15 characters. The -e, or –exact, switch is used to prevent this from happening. The –exact switch tells killall that the command name must match and given the situation where there is greater than 15 characters, not to send the signal to any process in that situation. This would send the SIGTERM signal to all processes owned by the user dann. Unlike the kill or pkill you can only specify the user name it will not accept the user id. Notice the danger of this command as it would send the SIGTERM signal to all the process group id’s the xterm command is under. That means those process running under the 2752 and 3082 process group IDs would be terminated. If the command was run as dann then dann would not have permission to kill any of paige’s processes. But if the command is run as root, then both dann’s and paige’s processes would be terminated. Be very careful with this syntax as you can easily destroy the session of another user inadvertently instead of just terminated a single process name. No is the default so lack of choice results in the process not receiving the signal. The killall command has a wait option, -w, or –wait, that waits for all processes to die before returning to the prompt. This switch can cause killall to hand indefinitely should the process not accept the signal, so you may have to kill killall manually. Finally, killall can work in conjunction with SELinux and kill processes in a given security context with the -Z, or –context switch. As per the man page this switch must proceed any other switches and will take extended regular expressions as input. The killall command is similar to the pkill command in that it allows you to send signals to a group of processes given the command name.